This is a roll of 1000 of our "Not For Tobacco Use" stickers. They are 1/2" in diameter with a universally recognizable red circle & line through the words. In the 2016 the FDA expanded their jurisdiction to include the regulation, registration, and approval of all tobacco articles including tobacco pipes & vaporizers. As a result it is essential for stores that sell smoking accessories which are intended for legal, non-tobacco herbs or non-nicotine vapable juices to clearly define those items. Product labeling is one of the most effective and inexpensive ways of clearly establishing your products' intended use. 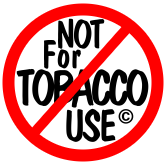 Additionally, many States have established OTP (Other Tobacco Product) taxes covering vapable juices, smoking accessories, and related accessories. These stickers can also assist stores in those areas by establishing their intent to State taxing authorities there by avoiding potentially thousands of dollars in back OTP taxes & penalties. All of this for $0.01 or less per item! Just need stickers? You can pick them up at http://www.IntentStickers.com and along with some amazing quantity discounts.